Step 1 Clean and crack the crabs, keeping the legs attached to their respective body segments. Using the back of a heavy knife, crack the shell of each leg joint (without breaking them into pieces) to allow the marinade to penetrate. Place in a large mixing bowl. Step 2 In a mortar and pestle, grind the fennel seed, red pepper flakes, black peppercorns and salt to a powder (some of the spice pieces will stay more intact). Add the parsley and the green onion and grind to a coarse pulp. Add the olive oil a little at a time until you have a wet, sticky sludge. Step 3Alternatively, you can grind the fennel seed, red pepper flakes, black peppercorns, salt, parsley and green onions in a blender, and then slowly add the olive oil with the blender running until you have the right texture. Step 4Pour the herb mixture over the crabs and mix with your hands, making sure each piece is coated evenly. Refrigerate for at least an hour to allow the crab to marinate. Step 5Start a hot fire in the grill. 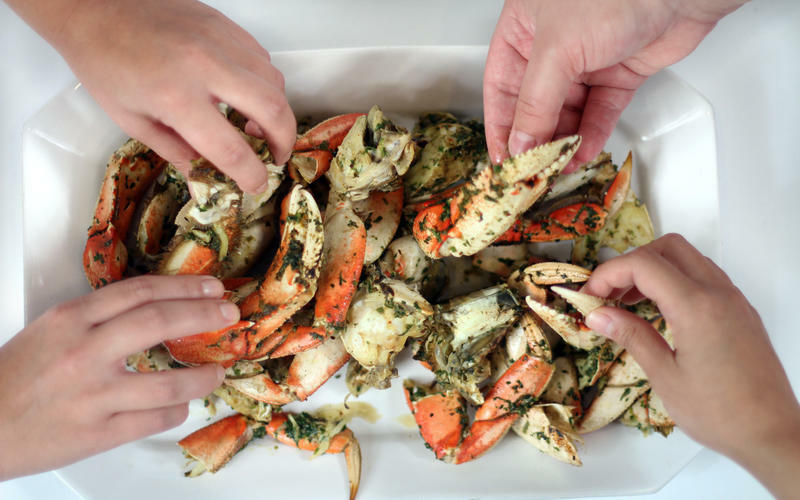 Empty the mixing bowl onto the grill and use tongs or a large spatula to distribute the crab pieces in a single layer. Every 2 to 3 minutes, use the tongs or spatula to scoop and turn the crab pieces. The crab is grilled with you see traces of scorching on the shell and some of the herb mixture has blackened, 6 to 7 minutes. Step 6Alternatively, spread the crab out onto a rimmed baking sheet and broil until the shell is lightly scorched and some of the herb mixture has blackened, 4 to 5 minutes. In Recipes-list.com we have selected the most viewed recipes from category - Appetizers Fish and shellfish Grilled Main courses . Enjoy the best recipes specially selected for you! Grilled Dungeness crab is the right choice that will satisfy all your claims.